HRD Antwerp has issued a grading certificate for what it describes as the world’s first wearable ring made entirely from a single CVD lab-grown diamond. The ring has been created by Dutch Diamond Technologies (DD) and has been cut from a single large 155 carat rough CVD lab-grown diamond, which was polished using laser cutting and traditional techniques. The company has said that the ring, named Project D, took a year to manufacture and was created to mark its 10th anniversary. 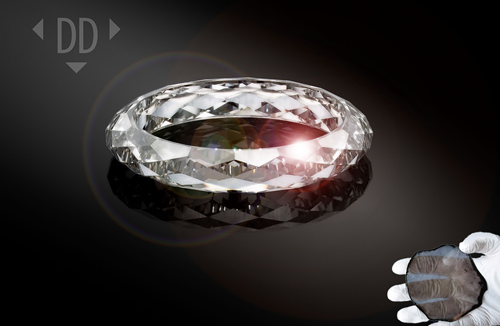 The ring has 133 facets, compared to 57 for a standard brilliant cut, with a total weight of 3,865 carats. The grading certificate describes the ring as having the following characteristics: Clarity VVS2, Colour E, Fluorescence NIL, Polish Very Good and Symmetry Excellent. HRD’s lab-grown diamond grading reports are easily distinguishable from the natural diamond grading report by the green colour cover. HRD said that growing monocrystalline lab-grown diamond plates large enough for such a project only became technically feasible in 2017. The lab said that prior to this, wearable rings made from a single rough crystal have been manufactured, citing the one made by Swedish jeweller Shawish in 2011. It added that Diamond Foundry has also announced plans to develop a similar ring cut from a single piece of lab-grown rough.